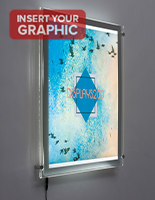 These plexiglass wall frames offer a three-dimensional display for all your graphics applications. 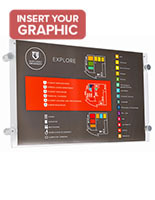 Most of the holders are mounted with sign standoffs that lift the poster off the wall for a more dramatic presentation. 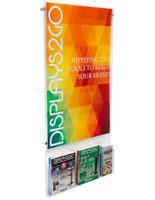 Our plexiglass wall frames are excellent choices for retail and professional settings. 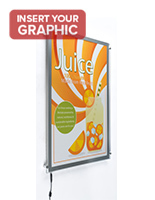 The sleek frameless design with sharp-looking standoffs showcases your posters and signs beautifully! 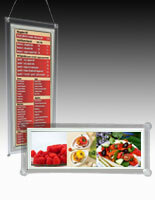 We offer these plexiglass wall frames in tons of sizes to accommodate most standard graphics formats. 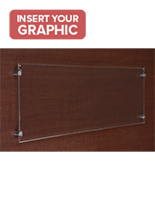 Why are these acrylic sign holders some of our most popular products? 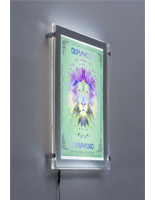 These plexiglass wall frames are made of high quality acrylic plastic with polished edges for a more professional appearance. Augmented with the edge grip standoffs, the holders allow easy access when it's time to swap out old graphics. Bulk purchasing enables big savings; outfit an entire organization with one-stop shopping. 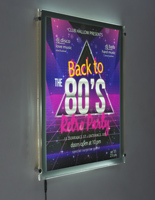 These poster frames bring a sense of lightness to any wall mount application. 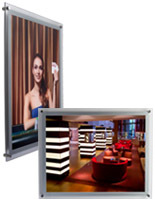 The frameless look with raised mounting adds clean style to more modern interiors. 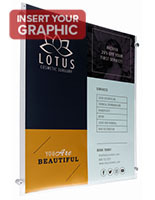 Instead of messing around with traditional rear-access framing, your posters simply insert inside the plastic holder from the front. Small magnets embedded inside the acrylic at the top of the opening keep the enclosure from popping open. Available sizes include all your standard small formats, including 8-1/2" x 11" and 11" x 17", as well as holders for posters in the 18" x 24" to 24" x 36" range. What are some application examples for these acrylic frames? 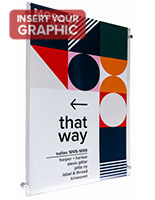 Wayfinding Signage - Hospitals, offices, and educational institutions need a way to direct lots of people to designated rooms or the stairwell in the event of an emergency. 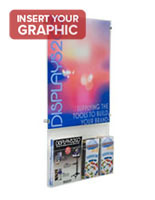 Retail Marketing - Displaying adverts for merchandise or other promotional messages keeps shoppers informed about new product launches or seasonal sales events. 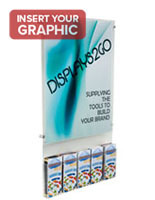 Exhibition - Museums and galleries use a dedicated poster space for advertising upcoming exhibitions. 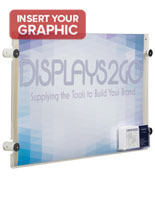 When needed, a new poster goes in its place quickly and efficiently. 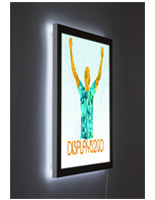 Other models available within this category feature acrylic framing with LED backlighting. 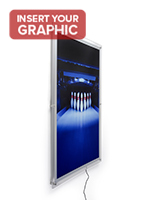 The profiles are super thin with a top and bottom plate that sandwiches your graphics. 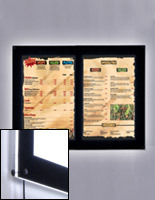 These styles come with black or silver borders and also mount off the wall with a set of standoffs. A third type comprises another sandwich-style design with one important difference. These come with two mounting options: suction cups for attaching to windows and a hanging chain kit for suspending from the ceiling. These picture framing options are affordable alternatives to standard wood or aluminum mouldings. 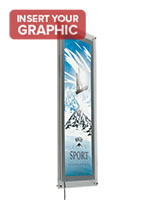 Their crystal-clear presentation, along with the visual impact provided with sign standoffs, combine for a handsome graphics display suitable for any interior decor.